Tomato Jackpot-Also Known as PANZANELLA! Last week I talked about drowning in zucchini (www.dvo.com/newsletter/weekly/2014/08-08-111/cooknart7.html?CID=club_news8-08-14). Well, the fun just doesn't end. Now I'm drowning in tomatoes. I don't mean to sound ungrateful. I've grown gardens that produced next to nothing, so I get how grateful I should be. And I am, but I'm still drowning in tomatoes. So in desperation I went web surfing, hunting for some highly recommended tomato recipes. And did I hit the jackpot-Panzanella is the name, and serving up an incredible summer salad is the game! Panzanella is a Tuscan summer bread salad. At one time it was considered peasant food, and folks would turn to it as a way of making stale bread palatable when there was little else to go with it. It's an extremely popular antipasto/first course at many restaurants in Italy today. And it's starting to get a foothold in the States as well. Like many other bread-based dishes, for example ribollita or pappa al pomodoro (oh brother, I haven't heard of these, either! 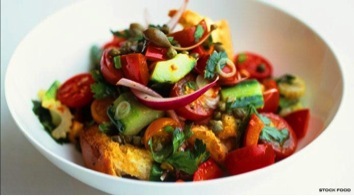 ), panzanella has become considerably richer since the end of WWII, because people can now afford to add more ingredients that nicely support the bread (ingredients such as tomatoes, cucumber and onion, for example). 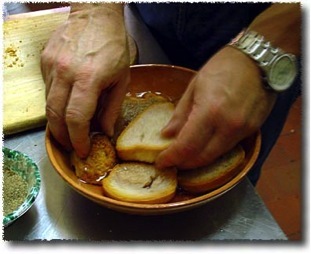 To make your own restaurant-quality panzanella, you'll need a loaf of day-old Italian bread (one with a firm crust and crumb), with enough body to be able to stand up to being thoroughly soaked. American-style soft breads of the sort baked in a baking tin simply will not work for panzanella, because they will collapse into a paste. Ciabatta bread is a good place to start. But don't get set on this list-you can add to or subtract from as much as you want. It's a versatile dish and as such works well with experimenting. The variations you can come up with are limited only to your imagination. I found combinations calling for capers, pitted sliced olives, and even crumbled canned tuna. I plan to add smoked gouda to mine, for instance. I learned how to make this yummy dish on www.Italianfood.about.com. Here's what you do: First soak your bread. 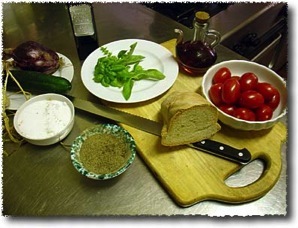 Note that plain bread is bland, especially Tuscan bread, which is made without salt. 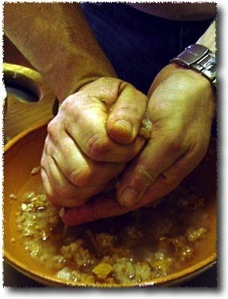 To counter the blandness, add some vinegar to the water you soak the bread in-about a quarter cup to the bowl. Then you'll slice your bread-about ½-inch slices work best. As you slice the bread, slip the slices into the water. The longer they soak (within reason) the better; at the very least, soak it for 20 minutes. While the bread is soaking, slice your tomatoes. Next, peel and slice your cucumber (I didn't peel my cucumber and the salad tasted fine). Finally, peel and slice your onion, and separate the slices into rings. In terms of proportions, the cucumber should be about 1/4 the volume of the tomatoes, and the onion 1/3. If you are adding other ingredients, add them to taste. The final thing to do is toss "an abundance" of chopped fresh basil over all. Next, season with salt and pepper, and add a goodly drizzle of extra virgin olive oil. At the end of your soaking time you'll need to squeeze the bread hard to extract as much moisture as possible -- it should be soft and damp though not bone dry. And this is why you need bread with a firm crumb -- a soft crumb will not stand up to being squeezed this way. 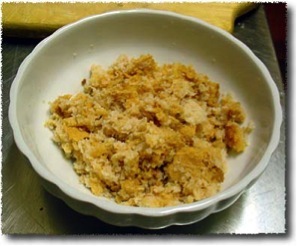 The author of the article on making panzanella said it is much easier to show, than to explain the texture the bread should have after it has been squeezed and crumbled into the bowl (so let's study this picture). 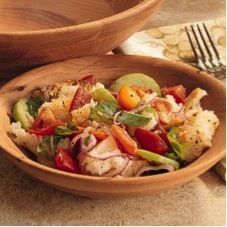 Finally, combine the squeezed bread with the prepared salad ingredients and toss well. You can garnish with a couple lovely basil leaves if you like, but now it's time to enjoy this delicious tomato jackpot-panzanella!